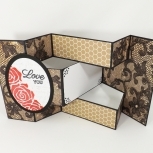 This custom scrapbook album has space for some 5x7 inch, 4x6 inch, and 3.5x2.5 inch photos and spots for writing your message, stories, wishes or memories. There are two swing tabs to open and close interactive page features. The Baby's First Christmas Scrapbook MIni Album has 3 signatures and 12 pages, spaced 1/4 inch apart and a waterfall type photo holder on the back cover.